I am in Cardiff in Wales. I ventured down for the weekend from Birmingham, mostly because it looked close on the map, though I have since found out that the train from London to Cardiff is quicker than the train from Birmingham to Cardiff. 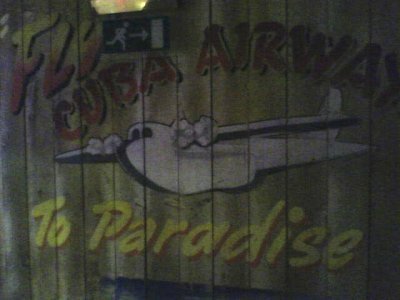 Last night I wound up having a few pints in a bar called Cuba. 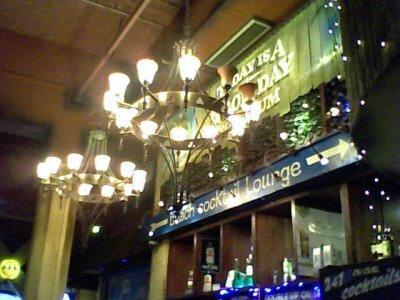 In the bar there was a band playing called Honey Fungus, an acoustic duo from Wales. One of the songs they broke into was Hotel California. I smiled, because back in 2002 I was in another place called Cuba listening to that exact same song. Sometimes songs that you hear when you travel are bound to end up sticking in your head and always reminding you of that place. Sometimes it is because you hear the song when you are there. For example, Two Princes by The Spin Doctors reminds me of Shawnee, Pennsylvania. I went there when I was in university for a our spring break with a bunch of friends. We were at the bottom of the ski hill (yes, there is skiing in Pennsylvania, but it's not great) getting ready to head up the hill for the day. A radio was playing from the lodge. The song Two Princes came on. At the end of the song, the DJ came on and said, "man, I love that song. I wish I could hear it again. Hey, wait a minute! I'm the DJ. I can play it again." And then he proceeded to play the song a second time. It was so bizarre that me and my friends all started laughing, and now whenever I hear that song, I am back at the bottom of the ski hill in Pennsylvania. The Ketchup Song by Las Ketchup reminds me of Chile. I was on the Navimag ferry between Pto. Montt and Pto. Natales in Chile. One night a couple of Australian girls tried to teach me to dance the Ketchup dance to the Ketchup Song in the bar / disco of the ferry. I had similar experiences with The Soca Boys' "Follow the Leader" during my trip to Mexico in 2001, Wonderwall during a trip to Whistler 1997, or Let's Get It Started by the Black Eyed Peas for Costa Rica 2004. Other times, it's because of lines in the song. When I was in China, I remember humming Beautiful Day by U2 a lot to myself, mostly because it contains the lines "See the world in green and blue, see China right in front of you." I spent a year working in New Jersey just outside of New York City. There is a ton of references to New Jersey in the song "Tweeter and the Monkey Man," originally by The Travelling Wilburys. The song is a tribute to New Jersey boy Bruce Springsteen. For me, though, the version I best like of the song is by the Canadian punk band The Headstones. Two lines in the song really stuck with me. I spent a weekend in Jersey City. Like much of New Jersey close to Manhattan, it's one of those places that has two sides - the nice side of condos, restaurants and bars along the water and close to the transit hubs into the city, and the dirty, grungy side further away from the Hudson River. I took a walk through both sides of the town, and I could see more than a few places that probably had illegal gambling games going on in the back rooms. If you've spent any time in Florida away from the tourist traps, you'll find a lot of people from other places, people who seem like they just burnt out on life and somehow wound up in Florida, working lazily at menial jobs, just making enough cash to get some booze and hit the beach. Some days I really felt like joining them. Hotel California, originally by The Eagles, actually reminds me of a few places I've been. California, obviously, when I would often find myself humming the song to myself. It also reminds me of a few actual hotels I've seen - one in Costa Rica and one in Canada. Whenever I see a hotel called "Hotel California," I can't help but start singing the song. The lines "you can check out anytime you like, but you can never leave," has always stopped me from actually checking in to a place that shares the song's name, though. 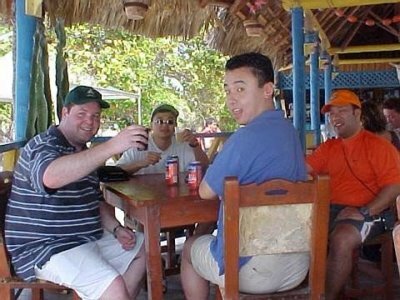 In 2002 I travelled down to Cuba for a beach holiday. Myself and some friends were staying at a resort, but we wanted to get out and see Cuba so we often wandered away from the hotel. One day we took some of the bikes from the hotel and pedalled into the town of Varadero. We pedalled around, and wound up grabbing lunch at a little beach-shack restaurant. Myself and my friends were the only non-Cubans in the place. There was a trio of musicians called "Trio Amanecer" that was wandering from table to table entertaining the guests. They played mostly Cuban music, but when they got to our table and saw that we were definitely not native Cubans (I am white and I was with 3 Asian guys) they decided to play some foreign music, so they played Hotel California. The singer didn't speak English, so he was phonetically singing the song. Generally he did pretty well, but there were some things he messed up. After the song, I bought one of the trios CDs, which included Hotel California. So that's what I was thinking about, standing in a bar in Cardiff, Wales. I was thinking about Cuba, and chicken grilled over an open fire, an ice cold cola and three Cubans playing an American song for a bunch of Canadians. More than songs that remind me of places I have songs that I always listen to when I travel. On sad travel days Michael Buble's "Home" and Michael Jackson's "Stranger in Moscow" are my listening companions. On days when I wish I could tell my family what I'm seeing, John Mayer "3x5". Of course, whenever I hear Zydeco music, I do think of Louisiana!